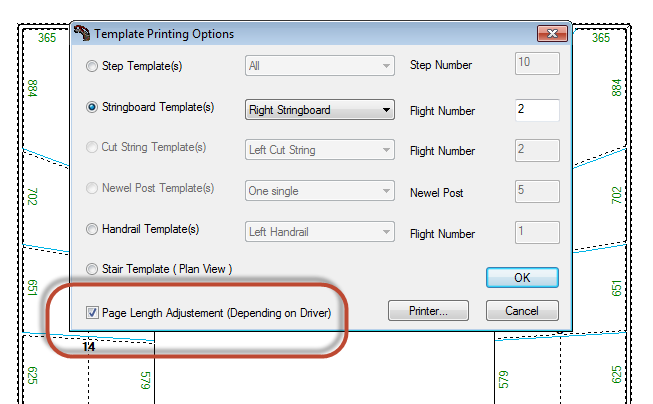 DXF export will enable you edit and print as you like. The template print will optimise according to the paper size you set and tile the number of sheets necessary. If you have a continuous roll of paper the program can adapt the length to the size of the part but this depends and has to be set up on the printer driver. Print Project will print to the scale you select if it’s possible to fit it on the paper size you select. If not StairDesigner will adjust the scale. This is to get a general workshop document. You can cut steps and posts from the displayed dimensions but strings don’t have enough information to mark them out. Print Template is used to print all the parts full size it will always print to 1:1. The Printer button will enable you to set up the paper sizes StairDesigner will tile the drawing onto the number of sheets necessary accordingly. thanks. and as i understand: if i want export to dxf, i can edit the print in autocad as i like. in the stairdesigner-print (Template) the program can’t be edited (position of f.exs. the strinboard can’t be rotated so it fit on one paper if possible)?